Best.Party.Ever. was a collaboration between Target and celebrity event planner David Stark to promote Target's holiday line of products. Target needed a campaign that was highly social and got people excited about the holiday season. They also needed a way to showcase celebrity event planner David Stark's great party planning ideas. What better way to plan a party than by creating a Pinterest board? 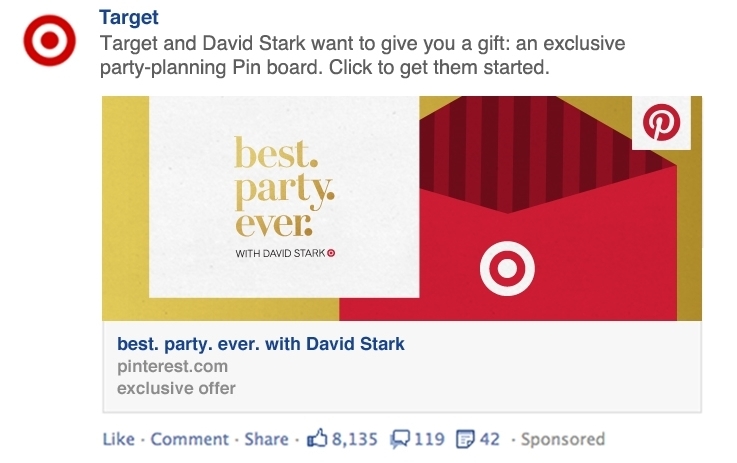 Working with David Stark we created four themes for party planning pin boards, all curated from products in store at Target. Select Target Red card members were invited to sign up to receive a personalized party pin board based on a short survey of their style and preferences. We created party perfect holiday playlists using Spotify, complete with themed album art. David wrote quick tips and notes for each theme that we then designed as individual pins for each board. We also created pins for craft projects using Target products and pins that were simply Target product shots.